Mandy’s Mission? 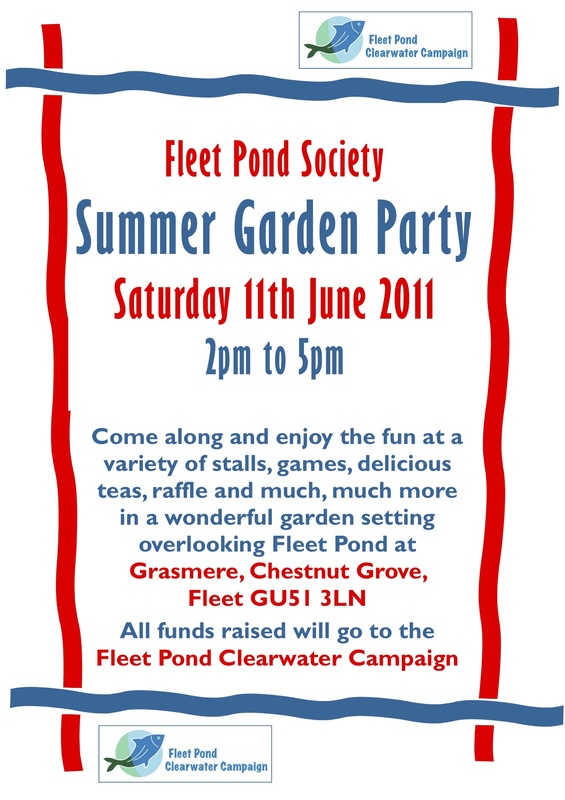 To Save Fleet Pond! Last year, Fleet Pond Society Treasurer, Nick Keeley, cycled to Liverpool and back and raised over £4000 for the Clearwater Campaign. This year, fellow committee member and pond dipwell reader, Mandy Saxby, set about thinking of something equally challenging, but a little different, to try and raise funds. The result is 24 Hours Of Le Pond. 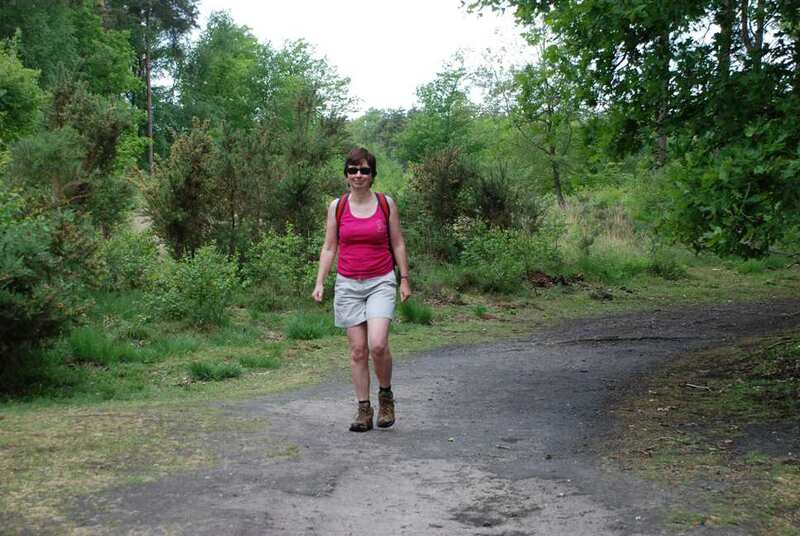 Mandy’s mission begins at 7.30pm on Friday 24th June and her challenge is to keep walking, in and around Fleet Pond Nature Reserve, for 24 hours – finishing at 7.30pm on Saturday 25th June. As well as sponsoring Mandy, you can also pay for the “privilege” of walking with her for an hour or two on her epic 24-hour journey. 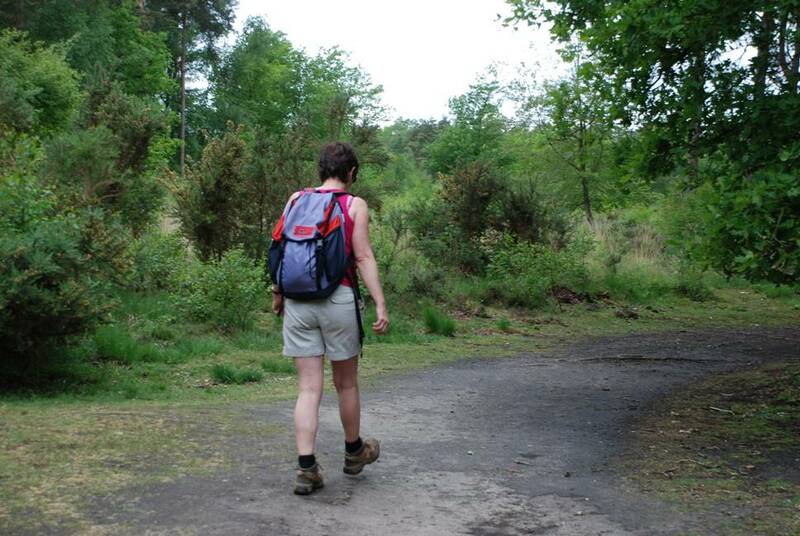 If you would like to walk with Mandy please e-mail her with the subject heading 24 Hours Of Le Pond. 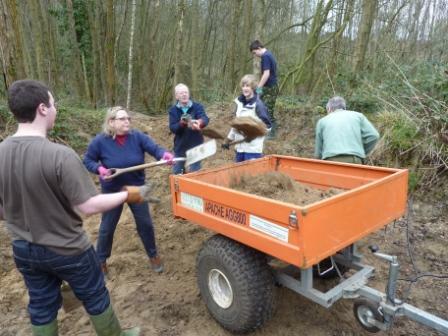 Fleet Pond’s Clearwater Campaign was launched to raise money and awareness to help tackle the silt problem which threatens to turn Hampshire’s largest freshwater lake into a big, muddy puddle! 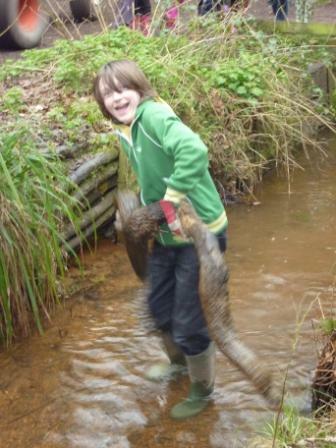 The campaign aims to raise funds to dredge and restore the pond, with a series of projects designed to improve the biodiversity and amenities of Fleet Pond Nature Reserve. Mandy in training for her mission! Dimension Data’s 12 Hour Challenge! Staff at Dimension Data rose to the challenge of a 12 hour fun relay around Fleet Pond and raised £1000 for the Clearwater Campaign. The Refresh Fleet Pond initiative was organized to celebrate Dimension Data’s own brand refresh and environmentally friendly outlook and all the relay runners and walkers wore t-shirts featuring the new ‘green’ company logo. 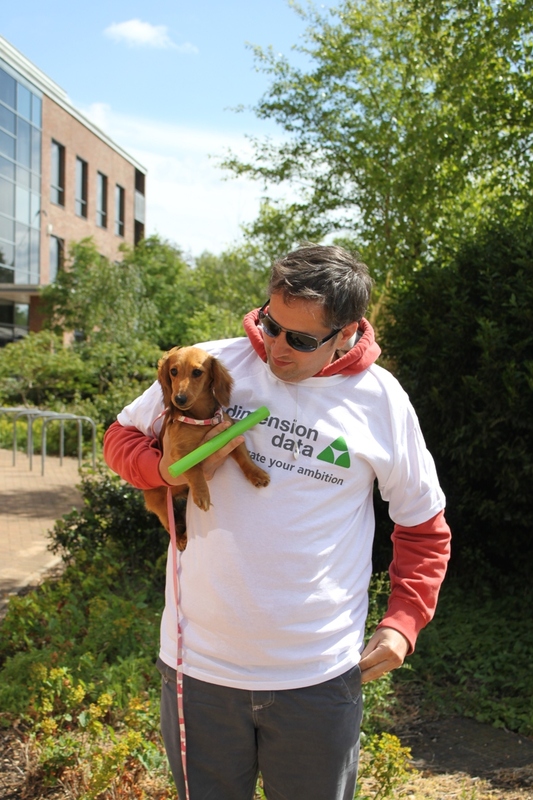 Kicking-off at 7am on Tuesday 10th May, a continuous stream of walkers and runners circuited the pond on a hot, sunny day for 12 hours, with fifty Dimension Data employees handing over the green baton at the end of each lap. Far from being tired, many participants offered to go round again and the event finished on a high at 7pm, with nearly £500 raised from the day’s raffle and collection buckets, as well as online donations. 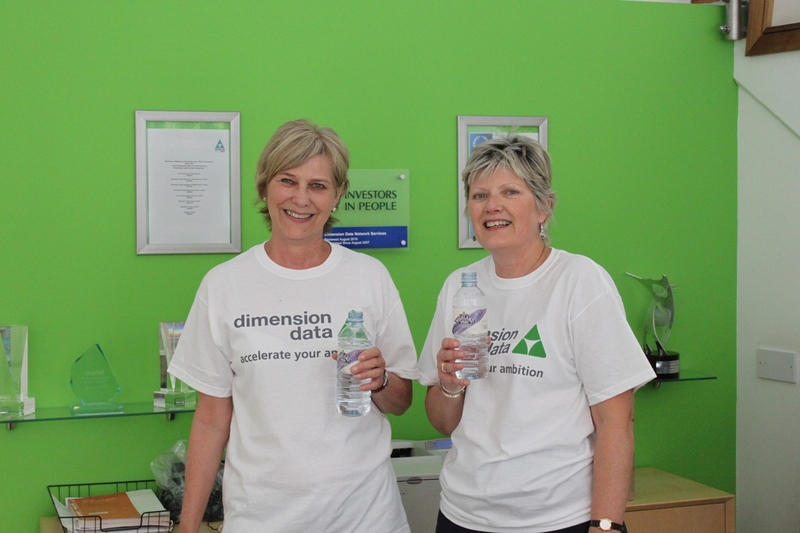 Colin Gray, Chairman of Fleet Pond Society, commented, “I would like to thank all the staff at Dimension Data for their generous response in organising and taking part in this event and to extend my gratitude to the management of Dimension Data for kindly agreeing to match the amount raised. I hope you find the “Butterfly of the Month” articles for April to September interesting. The hot and sunny weather we have had so far this spring has resulted in earlier than usual sightings of a number of butterfly species. My first Brimstone was seen on 24th February, a Small Tortoiseshell on 23rd March, a Small White on 4th April, an Orange Tip on the 6th, a Holly Blue on the 8th and a Comma and Large White on the 19th April. This must be an Orange Tip year, as I cannot recollect having seen so many during the past fortnight in any year previously. I have even had one lay an egg on an Honesty plant in our garden. Although very small, the egg is lenticular in shape and an orange colour, which made it easy to spot. 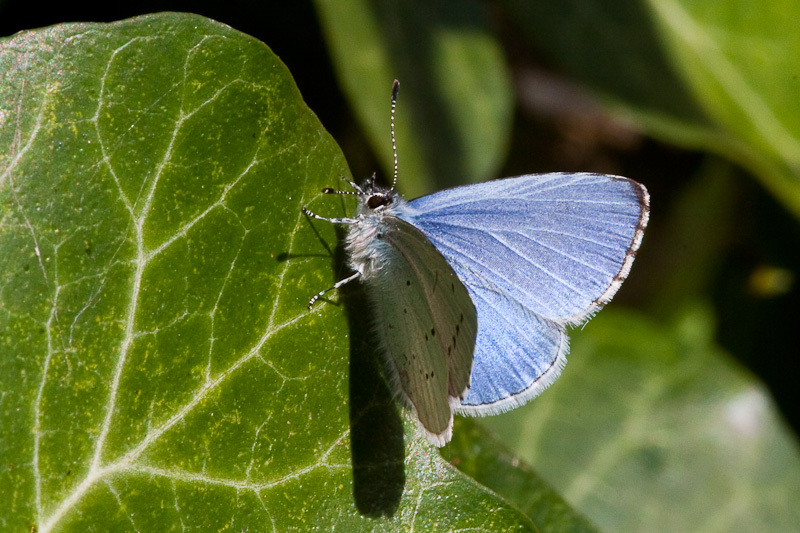 Keep a watchful eye open for these and other butterflies whilst walking around Fleet Pond. A Dog’s View Of Fleet Pond! 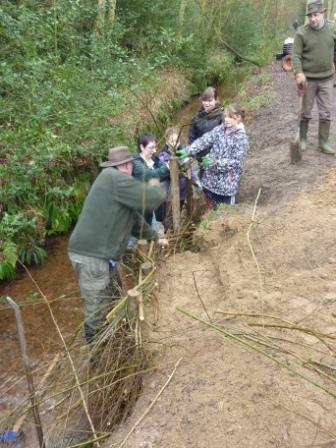 You weave the willow branch in and the willow branch out……..
No, it was not a green version of the ‘Hokey Kokey’ it was the instructions given to the team at Sunday’s conservation work party. This month the regular team’s ranks were swelled by the girls and leaders of the 4th Cove Guides. 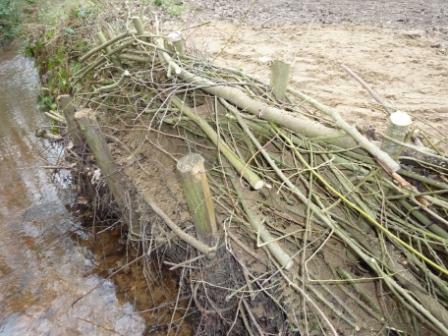 The task was to repair some breaches along the bank of the Gelvert Stream using woven willow supports. The whole team threw themselves enthusiastically into the task. 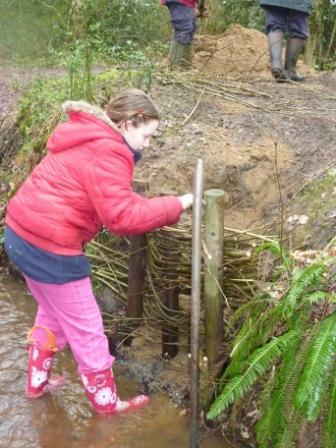 First, make holes in the stream bed ready for the poles. Then bang in the poles. Weave the willow branches in and out of the poles. Tons of sand was required to fill the breaches behind the woven willow supports. The shovelling team really put their backs into the job. 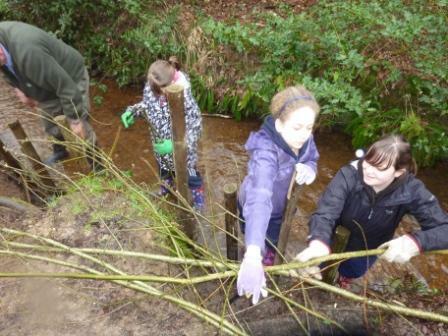 It takes a large number of willow branches to weave into those gaps. Nearly done! Just checking those branches. A pretty good job—should protect the banks for quite a while. 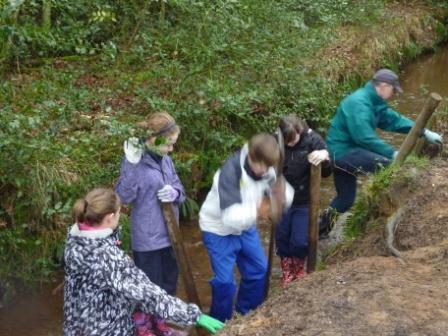 Might as well clear the stream of large logs while we’re at it! 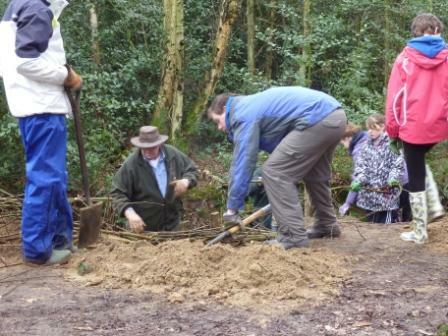 If you enjoy fresh air, rolling your sleeves up and working outside, why not come along and join us? We are a friendly bunch and meet on the second Sunday of the month; further details are available, for example, here. Editor: Apologies, I’m a little late in posting this one! There may be rather more green than usual around Fleet Pond on Tuesday 10th May, as employees of Dimension Data will be sporting their new ‘green’ company logo, as they raise money for the Clearwater Campaign. Dimension Data, an ICT services and solutions provider based at Waterfront Business Park, is refreshing its corporate brand identity and at the same time becoming more environmentally green. Dimension Data employees frequently visit the nature reserve for lunchtime walks and running sessions and, of course, enjoy a fantastic view of the pond from their office. So, to give something back to the pond, they have decided to support the Group’s global brand refresh celebrations, by holding a 12-hour Refresh Fleet Pond fund raising relay. 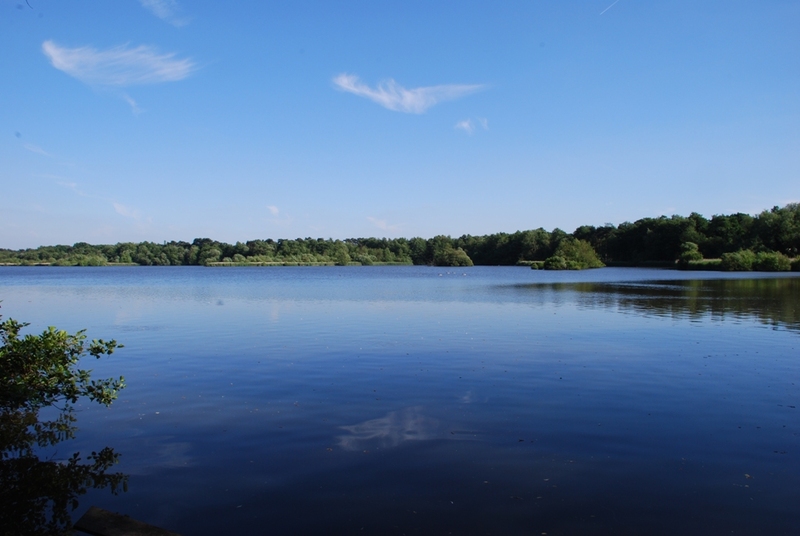 Starting at 7am, staff will take turns to run or walk around Fleet Pond, with a continuous relay of employees passing on a baton for 12 hours, until the last participant completes a final circuit of the pond at 7pm. Julie Long, head of Dimension Data’s UK Environmental Think Tank said, “This local amenity is very popular and deserves to be kept in the best possible condition with a balanced and sustainable ecology. You are currently browsing the Fleet Pond Blog blog archives for May, 2011.